Erected by Murdo McIvor Newlands in loving memory of his wife. Margaret Macaskell died 30th April 1913 aged 70. Daughter Isabella McIvor died 18th June 1895 aged 25. 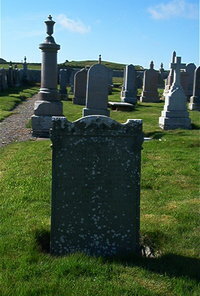 Son Murdo McIvor died 18th March 1889 aged 3. Husband Murdo McIvor died 20th March 1937 aged 97.